The job of loading baggage on airplanes is hard, but it doesn’t have to be harmful. 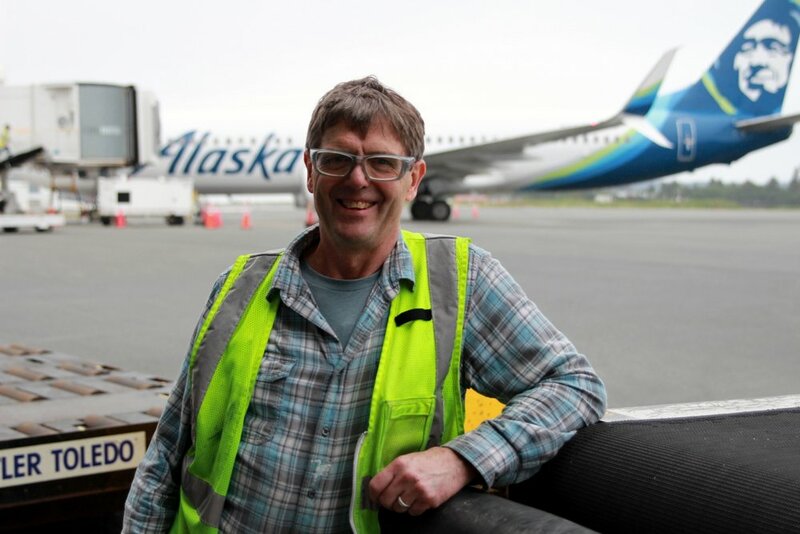 In Sitka, a baggage handler — or “ramper,” as they’re known in the airline business — has designed and built a piece of equipment he hopes revolutionizes the way luggage moves inside an airplane, and spares the people who move it a lifetime of pain. I’m out on the ramp at Sitka’s Rocky Gutierrez Airport, waiting with ramper Tim Fulton for the arrival of Alaska Airlines Flight 53. It’s a nice day in mid summer. Overcast. Not raining. KCAW – So, thirty years of standing here waiting for planes to show up. KCAW – Do you have butterflies in your stomach? 53 circles low over Sitka Sound and touches down, trailing ribbons of mist from its wingtips. Standing out here as the Boeing 737-800 pulls up to the gate is a trip — but the only place I’m going today is inside the belly of this beast. I climb up the belt loader and into the aft belly with Fulton, and his partner today, Craig Langenfeld. Fulton – Let’s try this first! This is where Fulton’s device will see its first full-turn trial — unloading, then loading this luggage bin. KCAW – You know, just speaking as a passenger I’ve always imagined that you guys were walking down here, shelving bags like library books. This is just the trunk of your car times 100. And you’re just trying to get things to fit any way you can. 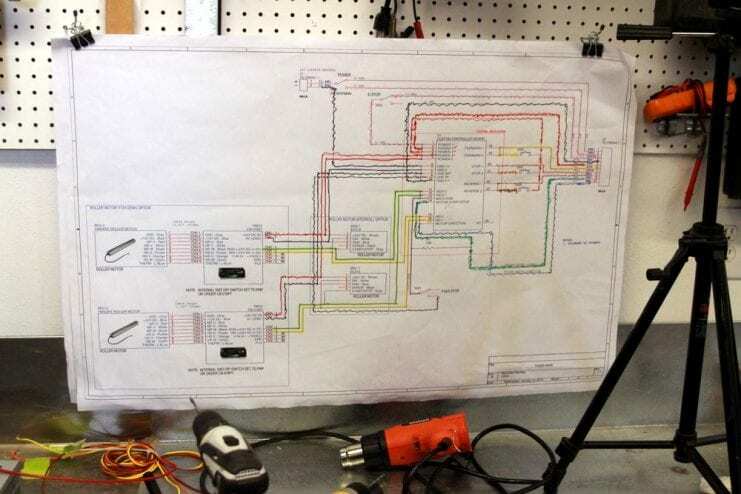 Craig Langenfeld – Try and load the trunk of your car from inside your car. KCAW – Loading your trunk from the inside! Right! 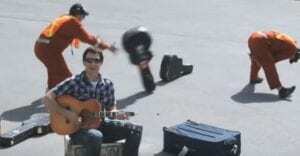 Watching rampers work brings to mind country singer Dave Carroll’s viral YouTube hit United Breaks Guitars. But having seen them in action, it’s obvious that to a ramper, your bag — your clothing, your fish, your tools, or even your Taylor Guitar — is just weight. Weight that has to be pushed or tossed, and stacked on a pile that begins far from the doorway — by two people working on their knees. Today, flight 53 carries a relatively light load in the aft belly, only 2,300 pounds. There is a lot more at risk here than guitars. Speck has treated a lot of rampers in over two decades of his Sitka practice. I show him a video of Fulton’s device in action in the belly of flight 53. He thinks it will be a game changer for the team that loads your plane. Working out of his garage — a fully-equipped machine shop, actually — Tim Fulton has designed and built “TISABAS,” short for TIm SAves BAckS. A lightweight, collapsible, conveyor belt that can take the heaviest bag you could ever pack. KCAW – So how much weight can it hold? Fulton – It was designed to take 150 pounds per square foot. That’s what it’s engineered for. So a conveyor belt is nothing new, but the TISABAS conveyor folds up in sections — like an accordion — to fit inside a plane’s belly doors. And then it extends or retracts, depending on whether the task is loading or unloading. Each time Fulton lowers one of the sections of TISABAS into position, the belt in that section automatically starts. And when he raises it, the belt stops. A switch reverses the belt’s direction. Back at the airport, the first full trial of TISABAS has been brilliant. Fulton and Langenfeld turned around luggage in the aft belly just a little faster than their colleagues forward — but Fulton, with two shoulder surgeries and a painful hip, says his back is doing just fine. An airline may assign a third person to load in the aft belly of longer aircraft, like the Boeing 737-900, but these rampers say that most of the time there are only two. My official guide for this visit to Flight 53 is veteran ramper Bob Weaver. Having suffered injuries to his elbow and shoulder, he sees promise in TISABAS. Weaver – I was impressed. This was the first time I’ve seen it in action and it worked a lot better than I expected, to be honest with you, Tim. That guy at the door has got to throw the bag from here to there. I mean it’s hard. Especially on the floors. Some of the floors slide well. Some bags slide well. Other bags don’t slide well. KCAW – Do you want to use this opportunity to tell the listening public what kind of bag we should get? Weaver – People bring too much stuff. You don’t need high heels in Alaska! What happened inside the belly of flight 53 today has been a long time in coming. And his distribution plan is simple: He’ll load TISABAS as cargo — collect to airports all over the world — in the belly of planes just like this one.